Manufacturing is a hot topic again, undergoing the industry’s greatest change in more than 100 years. Domestic jobs have evaporated from many countries with globalization, offshoring may be reverting to near shoring and automation threatens to replace more workers every day. The way we build and deliver the goods and products that fuel our economies and our lives will never be the same. As Professor Klaus Schwab has articulated in his book, The Fourth Industrial Revolution, we are in the middle of another industrial revolution - our fourth. The first industrial revolution occurred in the late 1700s (factories), the second during the early 20th century (automobiles) and the third after World War II (computers). As a result of these revolutions, products are manufactured faster and with higher consistency, and the products we are able to develop are increasingly complex and have greater value to consumers. New tools are allowing companies to create and test situations in the virtual world, to simulate the design process and the assembly line before an actual product is created. Simulating the product-creation phase helps cut down on manufacturing time and ensure the manufacturing process delivers what companies intended to create. At Flex, we are also using augmented reality solutions for remote assistance, allowing people in different locations around the world to connect in a live view and trouble-shoot together. This allows an engineer in China to consult with an engineer in the U.S. on a technical issue and receive feedback in real time through wearable Augmented Reality (AR) glasses, expediting problem solving and significantly reducing travel costs. Also making a mark in the manufacturing world is 3-D printing, which allows for the seamless creation of tangible products using a single machine. This is a fundamental change, because it gives you a lot more possibilities for how you design a part. For a certain category of product where you would normally need six pieces, 3-D printing can achieve the same thing in one piece without additional processes like welding or screwing. Three-dimensional printing reduces waste by recycling plastic and cuts down on the wait time for replacement parts and transportation. Its implications for mass production are various, making advancements possible in products ranging from toys to medical devices. 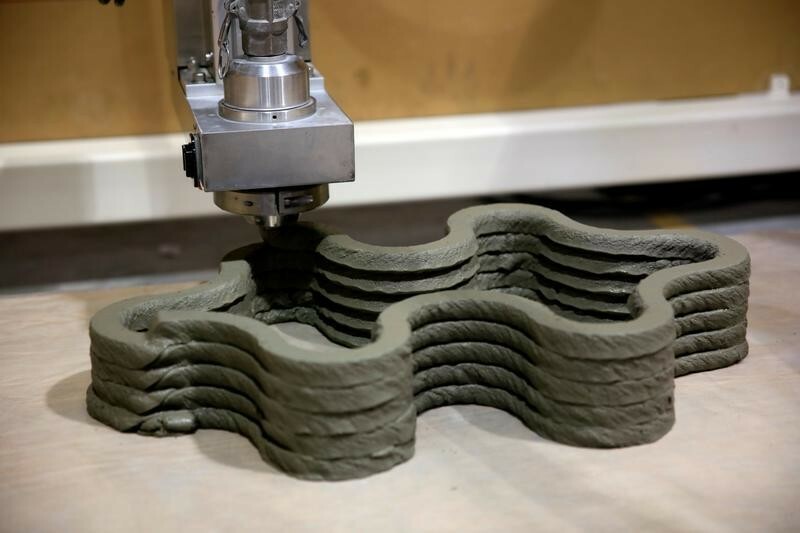 A concrete structure is 3D printed at Nanyang Technological University (NTU) in Singapore June 16, 2017. Automation is another vital aspect of the industry’s future. Approximately 50% of Flex’s manufacturing processes are already fully automated. Automation enables a level of accuracy and productivity beyond human ability—even in environments that would be considered unsafe for humans. The new generation of robotics is not only much easier to program, but easier to use, with capabilities like voice and image recognition to re-create complex human tasks. Another advantage of robots is that they do precisely what you ask them to do - nothing more, nothing less. And while automation eliminates some of the most tedious manufacturing jobs, it is also creating new jobs for a re-trained workforce, discussed below. In addition to robotics and virtual reality, factories environments are also driving advancements in cloud computing and smart sensors. Smart sensors can perform tasks such as converting data into different units of measurement, communicating with other machines, recording statistics and feedback and shutting off devices if a safety or performance issue arises. IoT functionality can track and analyze production quotas, consolidate control rooms and create models of predictive maintenance. IoT allows us to get the right information at the right time to make the right decisions, like a speedometer that shows how fast you’re driving in the moment versus your speed from yesterday. Cloud computing enables companies to extract and analyze information that affects the production line. Data from augmented and virtual reality, as well as increased customer feedback, will have a significant impact on research and development, giving consumers more of what they want, getting it to them faster and cutting down on costs—a system that ultimately will drive innovation. Building a better manufacturing sector with augmented and virtual reality, robotics and data analysis using smart equipment naturally raises an important question: What will the Industry 4.0 workforce look like? While there are still some significant challenges ahead, the outlook is strong despite the obvious concern of robots displacing jobs. The bulk of automation is used for work that would be considered unsafe or impossible for humans. This makes robots a complement to, not a replacement for, human workers. Because of robots, we’ll be able to increase our output. 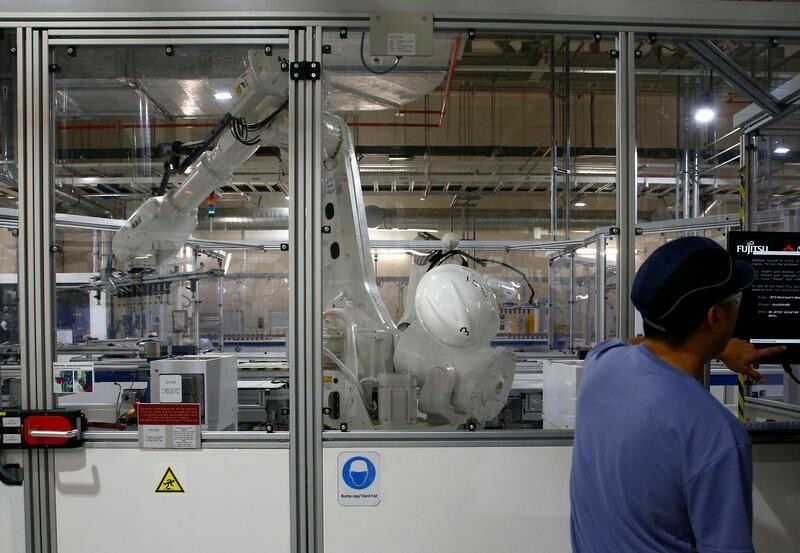 A robot operates at a production line during a tour of an REC solar panel manufacturing plant in Singapore May 5, 2017. We will still need people who can manage new operations, manage the robotics, program them and maintain them. Just as there was a shift from farm work to factory work in the early 20th century, almost every sector will need new kinds of workers: those who can build hardware, software and firmware; those who can design automation and robotics; and those who can adapt and maintain new equipment. Close to 15 million new jobs will be created in the U.S. over the next decade as a direct result of automation and artificial intelligence, equivalent to 10% of the workforce, according to estimates from Forrester Research - although technology will cause job losses too. Increased efficiency could spell a bright future for American manufacturing. A shift to smart manufacturing will save our corporations money and translate into greater profits, more jobs and healthier economies. As our machines move into a more complex age, so do our workers and products, symbiotically ushering in a new era of production. The internet of things will disrupt manufacturing for ever, but are you ready?